When we moved into our new little house, I got to open up a bunch of wedding presents that I had stored away. Finally taking them all out and opening them up was better than Christmas! I had so many kitchen gadgets I had completely forgotten about. I took over our only linen closet in the house, and converted it into a kitchen gadgets closet. Who needs a closet full of sheets when you can have your very own goody closet full of everything a cooks dreams are made of? Every shelf is full of stainless steel kitchen appliance that I just adore. I have the typical stand mixer, food processor and blender, but after moving there were a few more goodies I discovered that I had almost forgotten I had. A bread maker! A hand immersion blender! A fondue set! A vacuum sealer! A big crock pot that came with a mini crock pot! But best of all would have to be an ice cream maker. Even though we were deep in the unpacking stage, I immediately popped that ice cream bowl into the freezer so I could make us homemade ice cream right away. Let me remind you that it was over 100 degrees the weekend we moved. Nothing sounded better than a huge bowl of ice cold homemade ice cream. Trader Joe’s has this delicious strawberry coconut milk ice cream that I just love. I knew I wanted to recreate it. Not only is the strawberry coconut milk ice cream delicious, but it is dairy free and almost half the calories of regular ice cream. Coconut milk is a lot friendlier to the waist line than heavy cream. Tasty ice cream without the guilt! Dare I say it, but my strawberry coconut milk ice cream is even better than Trader Joe’s version! I don’t know if it’s because I get to make it in my very own pretty Cuisinart ice cream maker (which I LOVE! 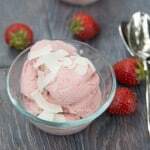 ), or if it’s because I am able to use the most beautiful, fresh strawberries, but this strawberry coconut milk ice cream is amazing. It is bursting with strawberry flavor, with the slightest hint of coconut. I can’t get enough coconut these days, so I love to top this with some roasted coconut chips. Gives the ice cream a great little crunch. 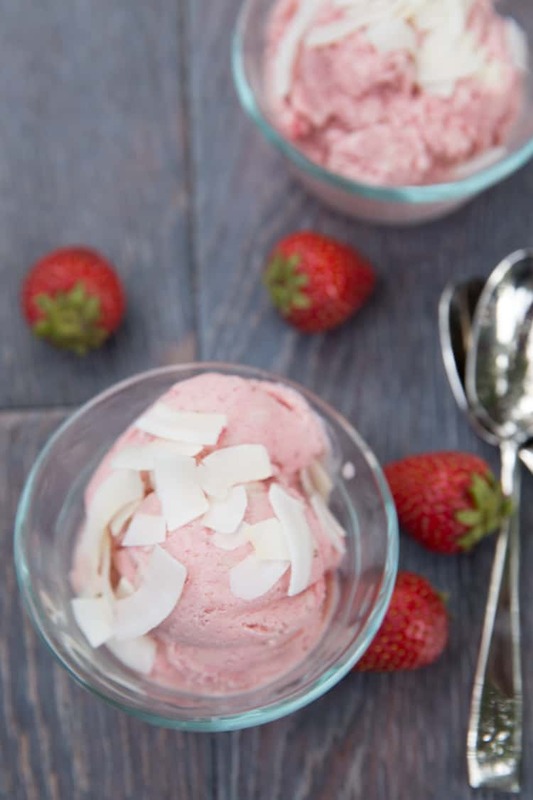 I’ve already made this strawberry coconut milk ice cream 3 times in the past 2 weeks. It’s my new favorite healthy, sweet indulgence. In a medium size sauce pan over medium heat, simmer the coconut milk and 1 cup of sugar until the sugar is dissolved, about 5 minutes. While the sugar is dissolving, place your 6 egg yolks in a medium size heat safe bowl. Whisk the egg yolks vigorously for at least 2 minutes until they are light in color. Temper the eggs by taking a ladle full of the warm coconut milk and slowly pouring it into the eggs, whisking constantly. Add in 1 more ladle full, whisk to combine, then add the tempered eggs into the pan of coconut milk. Add in vanilla extract and cook over medium heat for 3 minutes until the mixture has slightly thickened. Strain your ice cream base thru a fine mesh strainer into a medium size bowl, discard of any hunks. Cool the ice cream base in a double bowl ice bath, or place it in the refrigerator until it has completely cooled. In a blender, puree the hulled strawberries and 1 tablespoon sugar until liquified. Set aside. Cook your ice cream base according to your ice cream makers instructions. In the last 20 minutes, pour in the pureed strawberries. Transfer the ice cream to a freezer safe container and freeze for at least 4 hours until it is firm. Top with toasted coconut chips when serving if desired. -Don’t use low-fat or “lite” coconut milk, your ice cream will not freeze well and will be “icey”. Full fat works best. -If you don’t have fresh strawberries, defrosted frozen strawberries would work fine. Isn’t it so exciting opening presents you received in the past. I absolutely love my vacuum sealer and my bread maker, but must admit although I have an ice cream maker I have yet to use it. I think it’s time I change that and make some of your delicious ice cream. It will be perfect since Kurt is lactose intolerant and Briana attempts to eat way too much of the sugary ice cream. Can I just tell you how much I’m loving this version?! My hubby can’t have dairy and has been craving ice cream all summer long. I think you just totally made his day. He’s been too skeptical to try dairy-free versions from the store, but if I make a homemade version, I just know he’d be all over it :). I did something similar with our linen closet, btw. We don’t have a ton of storage space and I use ours as a pantry. It never gets old when people assume that they are going to grab a towel, but all they’re greeted with is Nutella, pasta, and a random assortment of chips, ha! This makes me long for my ice cream machine in storage! I absolutely love coconut milk, which is probably why I make thai curries so much :) But I love ice cream versions too! I’ve been looking for it here, no luck so far though. I might just have to buy an ice cream machine with the right plug! Oh wow I want a giant scoop (or two) of this right now! I recently made coconut milk ice cream too but definitely not the healthy kind hehe. I haven’t tried the one from TJs yet but I can imagine how your homemade version blew it out of the water! Wow! I love strawberry ice cream! Especially if I can dribble a little chocolate sauce on it! I am going to have to try this ice cream. Your photos are beautiful! 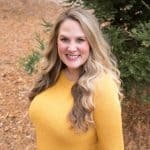 It was definitely like Christmas in July for you, Natalie! Now you can experiment with more fun gadgets! This ice cream looks delicious! I’ve never tried coconut milk before, but I like that it makes this ice cream healthy. Definitely makes you feel less guilty about eating a bowlful (or two)! YUUUUM!! This looks like the perfect post-moving-so-sore-can’t-stop-sweating treat! I would have gladly accepted a bowl, too. I’ve decided all summer I’m going to keep my ice cream maker bowl in the freezer, because you never know when a delish strawberry coconut milk ice cream recipe is going to cross your path. ;) I’ve never had the Trader Joe’s version, but this looks SO good – and SUPER creamy. Adding coconut milk to the grocery list right now! I’m so ashamed to admit how little I made homemade ice cream when I have an ice cream maker and it’s so easy! You’ve inspired me to put that bowl in the freezer and get started. I love that you used coconut milk for that slight coconut taste. I bet it was awesome with the fresh strawberries! Hi Natalie, great video, love your Cuisinart Ice cream maker! I have been on the hunt for a lactose free ice cream recipe and now I can finally rest – this looks so creamy! Yum! Strawberries and coconut milk is such a delicious combo! Great video! Your kitchen gadgets closet reminds me of what I did with all the shelving in our laundry room, I’d much rather store my kitchen stuff on there instead of silly laundry items. This ice cream looks lovely, perfectly refreshing and sweet for hot summer days! This looks really delicious! I love coconut milk ice cream! This looks so summery and refreshing! Love the idea of making coconut milk ice cream too! Love you video and this ice cream combination. Looks delicious! An ice video, Natalie. And your ice cream looks so good! You’ve already started putting that ice cream maker to good use. Goodness, that looks amazing. Totally pinning to our coconut board. I love everything about this recipe! I love watching your videos too, they’re so fun! Pinning this one, I need to whip out my ice cream maker now. I have seen this so many times today and couldn’t get it off my mind. And Natalie, I fall in love with your videos all over again, every time I watch them!!! What a beautiful video of making ice cream…you make it look so easy and soothing! Don’t get me started on the coconut shaving garnish….love the pics (as always, duh!) 100 degrees would make me eat all of this :P I really need an ice cream maker!! Thanks for sharing dear!! this looks too good.. i love a good strawberry ice cream – love that its relatively guilt free too! thanks for sharing! I’m pretty sure this is fate that I see this recipe because I finally just used my visa points that I’ve been collecting for an ice cream maker! I ordered it yesterday and now all I can think about is making this amazing recipe in it first. Coconut milk is the bomb. And coconut and strawberry -swoon! I love this video too! The curl of the ice cream is perfection. Gorgeous photos as always, Natalie! Also, a crockpot with a mini crockpot is the cutest thing I’ve ever heard of. It’s a crockpot family! Awwwww. Ughh! Isn’t unpacking the worst! I still have yet to have everything unpacked, and we have been moved in for almost 3 months! I have had the Trader Joes’ version of this ice cream and your recipe looks soooo much more delicious! Love it (and totally adding this to my ice cream make list)! Pinned! Darn it Natalie! you’re going to push me over the edge to buy an ice cream maker! I’ve been on the fence for so long. I also happen to love Cusinart applicances…I see one in my future.. I love how guilt free this ice cream is, that much more reason to try it. I love anything with fresh strawberries and the toasted coconut chips are a fabulous addition, YUM! Fabulous, absolutely love your video Natalie, and the pictures are beautiful. I have way more kitchen appliances than I ever have room for too! Putting them in a linen closet sounds like the perfect plan! My husband is always asking if we can get rid of a few of them, but I never let him, haha! I have an ice cream maker also, but I’ve only used it twice. This ice cream looks so good that I think I need to bust it out and try a third batch! 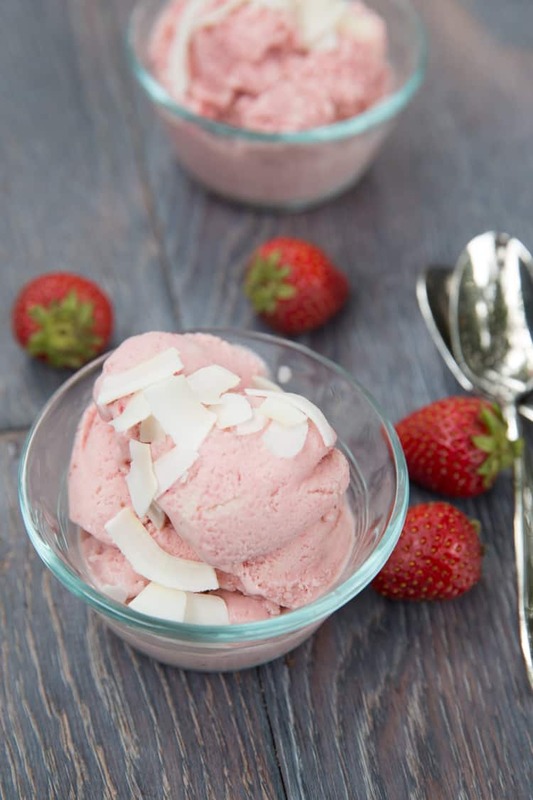 I’ve been loving coconut milk and I bet it is delicious in this ice cream with the strawberries! This is a must make recipe! This is making my mouth water! It looks amazing and refreshing! Oh my, this sounds awesome. I can’t believe you had that many kitchen gadgets you weren’t using Natalie!!! A mini crock pot inside a mama crock pot??? Adorable. Also, my mom gave me an immersion blender as an engagement present way back when and I was so embarrassed. I had no idea what it was and shoved it in the bottom of my dorm closet (yes I got married in college) so no one would see it. I hadn’t quite accepted the whole idea of marriage and domesticity, as much as I loved Eric, haha. So glad you guys are all moved in now!